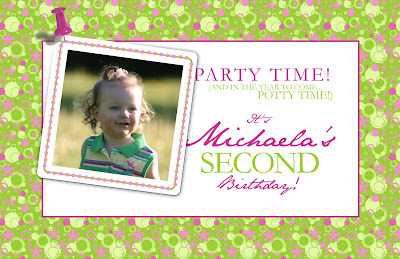 Michaela is turning two this Monday. Happy Birthday sweetheart. Happy Birthday Sunshine. Where has the two years gone? I am looking forwardee to your birthday party. rember that i love you so much. Hey Peanut, Mom Mom is going to buy you some cool toys for your birthday. You make my life so happy....I love you more than you will ever know. I love birthdays and turning 2 years old is a special one. We love your soooo cute invitation. You are very pretty and getting so big. We loved seeing you and Mommy & Daddy this summer. We are sending you many, many Happy Birthday wishes with lots of love on October 1st! PS-Look for a little something in the mail from us! Happy Birthday sweetie! Jeremy and I can't wait to see you and your family next weekend! I hope you enjoy your special day. Happy 2nd Birthday, Michaela June! I hope you have a fun time at your party and I know Mommy will have you looking oh so pretty...not to mention Mommom will also make that happen! Enjoy your day!